The Best of Africa World Edition series is a bold and positive step that expands our magazine's reach and frequency by offering individual countries an option to benefit from an exclusive, self cover magazine that is affordable and updated regularly. 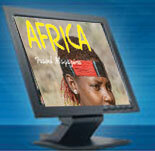 Our premier issue, the Ethiopia World Edition appeared in mid 2008 and more editions are on the way. We've been publishing Africa Travel Magazine for almost 14 years and its success year after year seems like a miracle to many observers. Like the Africa Travel Association which gave us our start and continuing support, we are nonprofit. Our focus is on partnered distribution with African governments, ATA chapters and related associations such as PATA, CCA,UNWTO, AFRAA, IIPT and ASTA, plus trade shows, hotel chains, airlines, foundations and business groups. Several years ago we partnered with Adventures in Travel Expo - providing advertising in exchange for exhibit space. This one decision allows us to circulate Africa Travel Magazine in New York, Chicago, Washington, Seattle and the Los Angeles market. Our magazine continues to appear at new show venues across North America, inside Africa and Europe. For our agenda of trade and consumer shows, university events and more, please visit our events page. On my first day with a national travel magazine in 1989, I made a vow to focus on producing magazine editions our readers will want to keep from one to five years or more. And it has happened! Earlier in my career, as a media buyer and later as an advertising agency president, I knew that many magazines had the staying power of a day or two. People has the attention span of a flea. A quick read - and soon forgotten! My reasoning was this - "If people put their time, effort, heart and soul, into producing a magazine edition, why not aim for the longest possible shelf life?" We call it a keeper? Like one of my idols used to say, "If you've got it -- flaunt it." So my goal was to create colorful, topical, well researched and targeted editions, such as we have with the Best of Africa series. I began with "Railways of the World," "Great Drives" and "Air Highways," paving the way for Africa Travel Magazine in 1995. Rather than make Africa Travel Magazine a quick read, I aimed for "keeper" status right from the start. The result? Almost fourteen years later, our back issues are still in demand. For example, our "Millennium Yearbook Edition" on Ethiopia is still as fresh as the day it was launched in 2000. Similar editions featuring Angola, Kenya, Cameroon, Uganda, Tanzania, Benin, Morocco, Guinea, Ghana, Angola, Zambia, Namibia and South Africa, enjoy the same lasting appeal. In a search for "Advertising Africa Travel and Tourism to North America," we're #1 and 2 from 227,000 entries, which indicates the value of advertising in our web and print media combination. Click here for an example how effectively we promote Africa Travel Magazine across the USA and beyond. 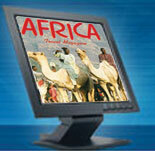 The answer is Africa Travel Magazine - a powerful, positive, influential media voice - in print, online and on air. We're foremost in delivering the "good news" about Africa travel, trade and tourism - a success record verified by top rankings on Google, Yahoo and MSN. Such results prove that our 12 years as publishers of Africa Travel Magazine are making their mark by appealing to upscale, well educated adult readers, who are sincerely interested in our positive, forward looking message. ALL issues of Africa Travel Magazine can be downloaded from our website and from the new Press Display site, which reaches hundreds of libraries, many Fortune 500 companies, and thousands of daily visitors from around the world. Have you heard about Africa Travel Magazine's GREAT CITIES OF AFRICA? We call them "Capitals of Culture and Gateways to Sustainable Tourism and Global Enterprise." Each city's airport will be profiled in "Air Highways to Africa," another Africa Travel Magazine supplement. Please visit our award winning, Google-friendly website. 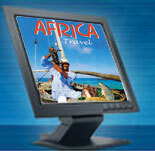 Search from over 3,500 pages on Africa travel, trade, transportation, hospitality and tourism. Learn how our media team can be your reliable long-range partner on the marketing scene. If you would like to get involved in our "Great Cities of Africa" Essay Contest or to be interviewed with comments on your favorite African city, please e-mail africa@dowco.com and we will send you a form.